It is a truth universally acknowledged, that (wonder where I’m going with this?) Scotch doesn’t play well others. There are very few exceptions to this… the Rob Roy (a Scotch Manhattan) and well, ice. Other than that, it’s pretty much a collection of ill conceived notions. This drink, however, is an exception. 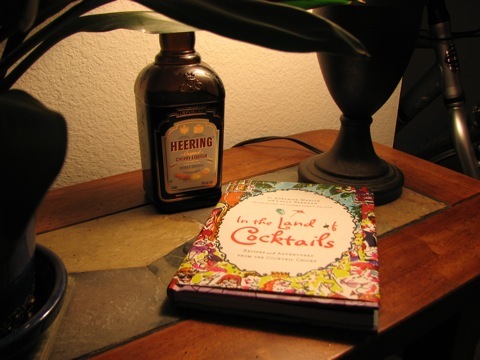 This one comes from a great new addition to our cocktail library, In the Land of Cocktails: Recipes and Adventures from the Cocktail Chicks by Ti Adelaide Martin and Lally Brennan, proprietresses of that noble brass rail, the Commander’s Palace in New Orleans. My opinion is that the cocktail is a bit on the sweet side, but B really liked this one. 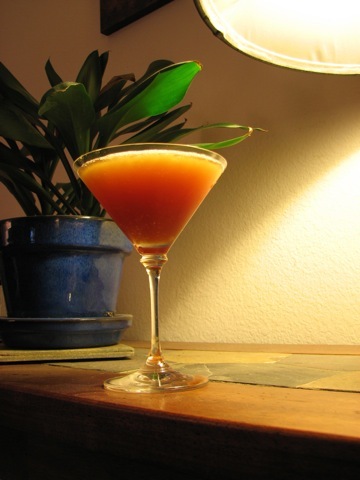 Personally, I think that dropping all of the ingredients except the Scotch to 1/2 oz and adding a dash or two of orange bitters would be a substantial improvement, which it turns out to be. What on earth is cherry herring????????????????? First, it’s a typo. I misspelled it. It should be Cherry Heering (not Herring, which would be a small oily fish). Second, it’s a Danish cherry liqueur that is dark red and fairly sweet. It’s name comes from the inventor Peter Heering. Most places put it in the brandy category, which I don’t really understand as it’s nothing like cherry brandy or kirschwasser (which is clear, not sweet and only vaguely cherry flavored). For this reason, I really don’t think kirsch would work for this drink.